In 9 more days, I will no longer be a teacher in the South Bronx. I’m not sure what to do with that. I’m not sure how to say goodbye to a classroom that I’ve spent more time in than my NYC apartment. I’m not sure how to say goodbye to the colleagues and friends who have made me laugh (oh have they made me laugh) and have been there for my cries. I’m not sure how to say goodbye to a year where I was not my best. As a kid (ok,and even now) I can’t leave something if I’m not on top. I can’t stop a game if I’m loosing.I can’t go inside unless I make the last basket (and I will stay until I do) and I can’t go to bed after watching a sad movie. (I turn on The Office and fall asleep to that. No lie.) I simply cannot end when I’m down. I’m not sure how it works with my heart. 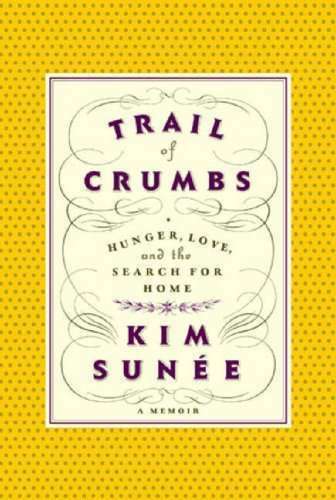 Speaking of heart, mine is currently being broken by Trail of Crumbs, a memoir by Kim Sunee. It is a written journey of hunger, love, and her search for a sense of home. My only problem has been that the beautiful narrative is often interrupted by recipes for French cuisine. It annoyed me. Until yesterday. 1. Cook first 4 ingredients…set aside and let cool. 5. Bake, uncovered. . . Let cool. . . So what did I find? My last year of life in a nutshell. Beat…Punch… Roll… These words have a familiar ring in my heart because it, too, has been beaten, punched, and rolled over. Ending a year where I’ve felt more failure than success is a hard year to end. I’ve even found myself building last-minute relationships with kids in my school who aren’t even my students. Is it a selfish attempt to make 1 more difference? To make up for what I didn’t do for others while I still had a chance? Maybe. I suppose I’m trying to wring out what’s left of myself in hopes that some good will come. But this oddly placed recipe reminds me of something. After the beating, rolling, punching, and extreme heat, you’re left with a beautiful and pleasing result. It’s all part of 1 whole. What comes before the end is necessary. I needed this year to teach me… to show me how to do what I thought I couldn’t. To love kids who didn’t love me back. Will I be ending “on top?” No. But I truly believe in some ways I’m still ending in some kind of beauty. And there is healing in that. And so I end with a poem. It’s a healing song by the Navajo Indians. So in my uncertainty of how to end a year, I end with the hope of the sense of restoration and beauty. Restore my feet for me. Restore my legs for me. Restore my body for me. Restore my mind for me. You have taken it away for me. Far off it has gone. Happily my interior becomes cool. My interior feeling cool, may I walk. No longer sore, may I walk. Impervious to pain, may I walk. With lively feeling may I walk. As it used to be long ago, may I walk. Happily, with abundant dark clouds, may I walk. Happily, with abundant showers, may I walk. Happily, with abundant plants, may I walk. Happily, on a trail of pollen, may I walk. Being as it used to be long ago, may I walk. With it be beautiful all around me. Not too long ago, I posted about how the end of seasons can be like Fall. We are wooed…ushered gently into the next phase with color and beauty, with crisp air to awaken our senses for something new. We walk around, not fearing the dreadful cold.We aren’t thinking of the snowy, slushy winter to come; no, we are too busy living in the moment. It’s Fall. It’s gorgeous. It’s good. No need to think ahead. Not yet. Seasons, by definition, must end. No matter how slow and gentle the closure, the curtain will fall. I didn’t remember this until I turned the page in my day planner today. I began inserting all the events packed into the last bit of school. Each time I get an updated calendar, I secretly love to look ahead and insert any foreknown events in future months. It’s a high– it makes me feel put together and very organized. (All an illusion, mind you.) Thankfully, my powerhouse angel of a friend and literacy coach IS actually put together and organized, so I get to do this quite often. Until today. On June 25th, meetings end. No more “BRING THIS”…No more Love Letters.. No more. Done. Nothing left to add. My job will be finished. [Enter RAIN and WIND.] Finality realized for the first time. I suppose I thought I could start my new job and life while this one continued. (Note to self: This is not LOST.) But that’s not how it works. Seasons end. It’s coming soon and I’m sad. The pit in my stomach from today’s realization has now made its way to my eyes, so rather than ramble in a fit of drama and sadness, I will give my heart a rest. And those leaves on the ground… well, I suppose I will go out of my way to walk in them every day until I have to say goodbye for good.